A supernova is an exploding star that expends more energy than it normally would. Supernovae or supernovas are extremely luminous and emit a powerful burst of radiation that often briefly outshines an entire galaxy. During this period a supernova can radiate as much energy as the Sun is expected to emit over its entire life span. The explosion expels much or all of a star's material at a velocity of up to 30,000 km/s (10% of the speed of light), driving a shock wave into the surrounding interstellar medium. This shock wave sweeps up an expanding shell of gas and dust called a supernova remnant. It is estimated that one to two supernovae explode in the Milky Way each century. The spiral galaxy NGC 1187 has had two supernova explosions detected, 25 years apart. The first was in 1982, and the second in 2007. NGC 1187 looks tranquil and unchanging, but it has hosted two supernovae explosions since 1982. A supernova is a violent stellar explosion, resulting from the death of either a massive star or a white dwarf in a binary system . Supernovae are amongst the most energetic events in the Universe and are so bright that they often briefly outshine an entire galaxy before fading from view over several weeks or months. During this short period a supernova can radiate as much energy as the Sun is expected to emit over its entire life span. In October 1982, the first supernova seen in NGC 1187 — SN 1982R  was discovered at ESO’s La Silla Observatory and more recently, in 2007, the amateur astronomer Berto Monard in South Africa spotted another supernova in this galaxy — SN 2007Y. A team of astronomers subsequently performed a detailed study and monitored SN 2007Y for about a year using many different telescopes . This new image of NGC 1187 was created from observations taken as part of this study and the supernova can be seen, long after the time of maximum brightness, near the bottom of the image. These data were acquired using the FORS1 instrument attached to the ESO’s Very Large Telescope at the Paranal Observatory in Chile. 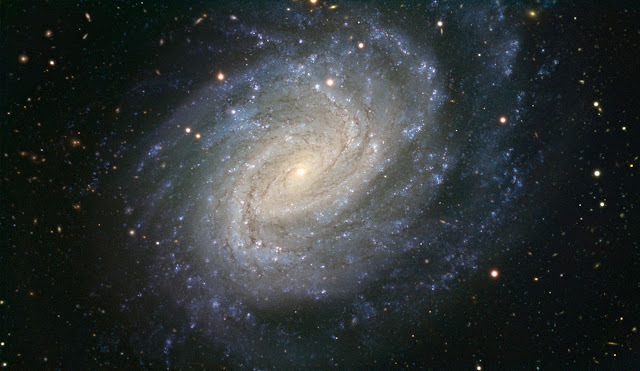 This galaxy was discovered in England by William Herschel in 1784. The International Astronomical Union is responsible for naming supernovae after they are discovered. The name is formed by the year of discovery, followed by a one or two letter designation. The first 26 supernovae of the year get an upper case letter from A to Z. Subsequent supernovae are designated with two lower-case letters. Further information about SN 2007Y is available in a paper by Stritzinger et al (THE HE-RICH CORE-COLLAPSE SUPERNOVA 2007Y: OBSERVATIONS FROM X-RAY TO RADIO WAVELENGTHS). Sun Unleashes X-Class Solar Flare.